Additional patient-care space; modern safety, security and other facilities systems; a single source electrical solution; non-disruptive operation throughout the project; increased ability to meet the healthcare needs of the surrounding community. To increase its nursing and patient-care capabilities. When this facility was built 10 years ago, the sixth floor was left empty to accommodate later growth. Eventually, it became administrative offices. But the growing need for more patient-care space required further renovation. Dynalectric helped make it happen by completing a scope of work that covered all electrical power systems, both medium and low voltage. After completely gutting the space, the company brought power from the first-floor central plant through branch sources on other floors to the sixth floor. There, the Dynalectric team installed branch conduit and wiring for motor control centers, as well as all lighting, receptacles, nurse call, security/card access, fire alarm, cable, and closed-circuit television systems. Throughout the process, logistics were a significant challenge. Since the hospital was in full operation during construction, the company used a combination of cranes and freight elevators to transport materials to the sixth floor without disrupting the client's normal healthcare routines. 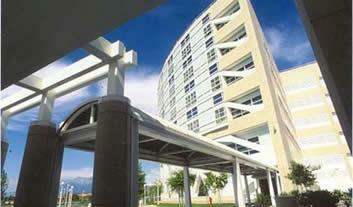 Arrowhead Regional Medical Center is a state-of-the-art 373-bed facility featuring the newest in patient-care technology. The Center hosts a 24-hour emergency department, a level II trauma center, transplant services, three family health centers and a burn center serving San Bernardino, Riverside, Inyo, and Mono counties.